Woohoo!! 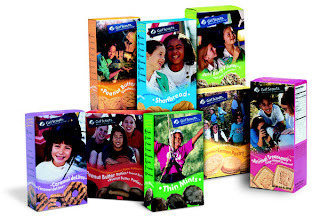 In the three the years that I have lived here, I have never, ever, ever come across a Girl Scout cookie booth. I don't usually know when it's officially cookie time, but at some point during the year I'll think, "Hey, did I miss cookie time??" Seriously, I haven't had a Thin Mint in YEARS. Tyler: "Oooooooh. Thin Mints!! How much cash do we have?" Me: "I've got ten dollars. How much does a box cost?" Tyler: "I have no idea. Oh my gosh. I'm going to get at least two or three boxes of Thin Mints." Me: "Don't forget about Tagalongs!! Tagalongs are soooo good." Tyler: "I have no idea what Tagalongs are. Maybe I should get four boxes of Thin Mints?" Me: "You know, the ones with peanut butter and chocolate." Tyler: "Oh yeah. Okay, so do you think five boxes of Thin Mints are enough?" Wouldn't you know it, we rushed out of the store to buy our cookies and they were SOLD OUT of Thin Mints. Poor guy. Tyler looked like a six year old who had just been told Santa Clause wasn't real. I felt so bad. He moped all the way home and talked about it for the rest of the night. I did get my box of Tagalongs (which are already gone), and Tyler seemed to approve them because he's added them to our Next-Time-We-Run-Into-A-Girl-Scout-Booth list. Six boxes of Thin Mints. Two Boxes of Tagalongs. "I can't believe they were out of Thin Mints..."